"... making us co-heirs wih him of his true glory, and the happiness of Heaven. Therefore we rise with our eyes and intellects to the Heavens, the Star, the Moon and the Sun, the supernatural creatures of God, the World, so in the fixed stars as in the mobile Planets. Each of them depends on its own intelligence which is the Angel..."
I agree on the parallels between the Pisa poem and the Anonymous Discorso! I would add to that line 8 of the poem refers to God as "Colui che non si muove ed è motore" (He who is a mover without moving), and in the passage you quoted the Anonymous also refers to God as "primo Motore". I have made a superficial search for a common origin of these two passages, but I could not find any convincing candidate. I have recently found this illumination (many thanks to Michael Hurst for sending me a link to this scan, which is much better than what I first saw). The image was painted in France in 1475 ca. God is represented as "the Soul of the World" ("Anima Mundi"). It is an illustration of Augustine's "The City of God" VII, 23 (Concerning the Earth, Which Varro Affirms to Be a Goddess, Because that Soul of the World Which He Thinks to Be God Pervades Also This Lowest Part of His Body, and Imparts to It a Divine Force). As the fresco in Pisa, this illustration represents “El mondo (cioe Dio Padre)” - The world (i.e. God the Father): the World and God joint as a single image. Moreover, it includes the symbols of the four evangelists, like we see in the Sforza Castle World card and later Tarot de Marseille World cards. That's a great image, thanks Marco and Michael. I think, however, it is not Augustine's "God" who is depicted, though, but no more or less than what the legend says: "Anima Mundi". The legend is there so that readers won't be misled and think it is God (the Father - who would be older, dressed differently, crowned, etc.) or Jesus (who would be distinguished as well, perhaps by a halo or his wounds). For what it's worth, I think that some of the early painted World cards are depicting an Anima Mundi as well (PMB is an exception, perhaps also the Cary-Yale). But the figures are purely decorative, a "human" addition to the card, and a figure's identity is not essential to the interpretation of the meaning of the card or its place in the sequence - it is just "The World" (the whole world). Ross G. R. Caldwell wrote: That's a great image, thanks Marco and Michael. I thought the image represented God on the basis of its similarity with the fresco from Pisa. But indeed in the illumination there is no halo, and Augustine rejects Varro's thesis that God is Anima Mundi. In the same manuscript, God is represented with a halo, for instance in images 303 and 304. So, I agree with your conclusion: this Anima Mundi is not God. Thank you for the correction! This is also an interesting point. I agree that Anima Mundi can be considered a possible "addition" to the main meaning. I tend to think that the new World of the after-life of Revelation 21 could also have been the original meaning of the card ("the holy city, new Jerusalem, coming down from God out of heaven, prepared as a bride adorned for her husband"). Lippincott discusses the Pisa fresco on pp-467-468 and makes a convincing argument that it too is a thema mundi-related creation of the world. I think the frequently depicted God's creation of the world (thema mundi or not) needs to be placed in the context of civic-minded world histories that culminated in the founding and recent histories of their own cities; i.e., those exercises connect the piety of a given city with a historical connection to God over time, impliciting Him in the fortunes of their city. To give one notable example: Giovanni Villani's Cronica first six books deal with the largely legendary history of Florence, starting in Biblical times to 1264 with the next six continuing on until his own time, all the way up to 1346. The article by Eve Borsook (research associate at Villa I Tatti/Harvard) notes the sceptre held by Christ is "surmounted by a fleur-de-lis and also a disk displaying an unusual image that seems to represent the world or universe. A ring of stars and a ring of water encircle a series of buildings depicted in the style of contemporary Florentine architecture, including the centermost building, which evokes the Palazzo Vecchio with its crenellated tower." In my opinion, the “thema mundi” is not related to tarot: it is the horoscope of the creation of the world, and the sequence of the trumps does not provide a horoscope. Actually, any explicit astrological information is missing from early tarot, with the exception of the Moon/Cancer association in the Cary sheet: nothing as detailed as the astrological chart of the thema mundi. Moreover, I think that the cosmological elements in the last trumps are better read as an end of times narration. Of course, the narration of the end of times (The Book or Revelation) mirrors the narration of the creation of the world (the Book of Genesis). But the presence of the Final Judgment makes clear that the context is not that of the creation. But like the Egyptian writing which reads to the left or the right, the twenty-first card, which was not numbered with an Arabic numeral, is nonetheless also the first, and must be read in the same way in order to understand the history; as it is the first in the game of Tarots, and in the species of divination that one performs with these images. The twenty-first, or first card, represents the Universe by the goddess Isis in an oval, or an egg, with the four seasons in the four corners: the Man or the Angel, the Eagle, the Ox, and the Lion. Nineteenth, the creation of the Sun which brightens the union of man and woman, expressed by a man and a woman who give to each other their hands: this sign became, after that of Gemini, androgynous: Duo in carne una. Seventeenth, the Creation of Stars and Fishes, represented by stars and Aquarius. Sixteenth, the House of God overthrown, or the terrestrial Paradise from which man and woman are precipitated by the blazing tail of a comet or star, joined with a fall of hailstones. To clarify - I believe the World trump derives from the thema mundi/creation of the world. Instead of the entire earth we see an adaptation of the circular framing of the world replaced with a vignette in that same frame of the local principality - like in the pre-tarot image I posted above that shows Jesus with orb and sceptre - commonly held by World figures - and the world-as-Florence; Mary intercedes on behalf of the Domincians who essentially are positing themselves as the right ordering of the city->world->salvation in that painting (and Mary is the patron saint of Santa Maria Novella, the Dominican church where that painting originally hung). I think the frequently depicted God's creation of the world (thema mundi or not) needs to be placed in the context of civic-minded world histories that culminated in the founding and recent histories of their own cities; i.e., those exercises connect the piety of a given city with a historical connection to God over time, implicating Him in the fortunes of their city. The rightly ordered city is rightly ordered becasue it is aware of and worships the theological history that follows from the thema mundi/creation of world - it is all temporally connected/"united". But no, there is no thema mundi per se in the cards. Naturally the prophetic look ahead to the End Times is also connected/”united” in biblical epic time, but there simply is no Apocalyptic evidence in the tarot. If the Devil trump card referred to is his End Time manifestation then why not also depict the Whore of Babylon (or at least hauling off a damned soul who has been judged)? Why is God in heaven in the Judgement not shown with 7 trumpets or 7 candles? Why is Strength not defeating a 7-headed dragon instead of a lion (in the case of the PMB)? “Judgement” (which should properly be called Resurrection) does not show anyone being judged and consigned to hell; it simply conveys the standard Christian belief in resurrection. The oldest “Hermit”/Time trump (again, from the PMB) would be a great place to depict the aged St. John with a scroll being shown the full panoply of time that culminates in the End Times but instead it is merely a richly robed, well-fed man sporting a Byzantine hat and a gold cane. There is ZERO apocalyptic imagery in the PMB – maybe someone from a later deck mapped something on to the original cards, but I don’t even see much evidence for that. There was a well established stock iconography in the way Revelations was depicted from the medieval through Renaissance periods - where is it? May be a curiosity for those who interpet the World card as the New Jerusalem, as an interesting ecclesiastical-liturgical embodiment of the doctrine. Her description of the descent of the corona, representing the New Jerusalem as well as a symbolic coronation that signaled the End Times, was too much to resist. I had to see McGrade's paper, to see if that were all true and to get some solid primary sources. 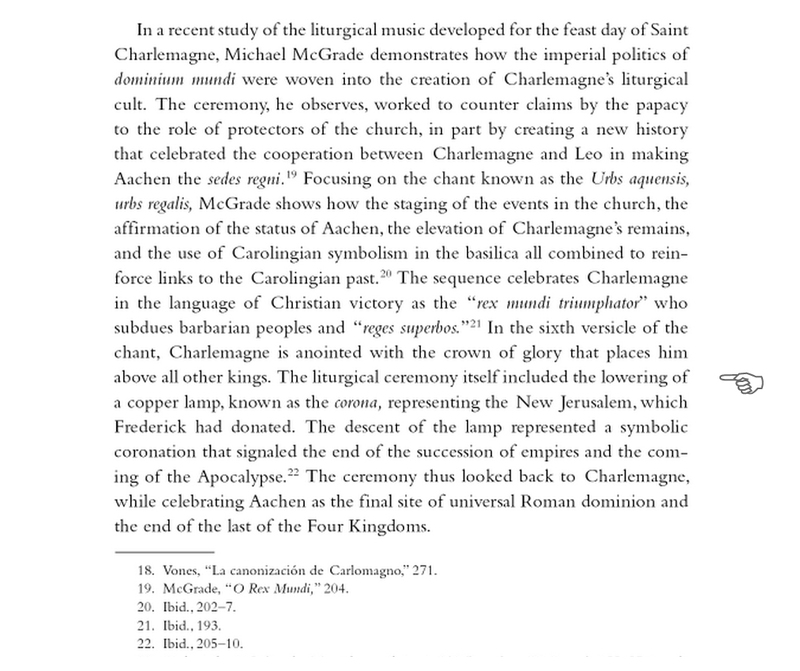 Michael McGrade, "O Rex Mundi Triumuphator: Hohenstaufen Politics in a Sequence for Saint Charlemagne", Early Music History, vol. 17 (1998), pp. 183-219. Of course he doesn't disappoint. 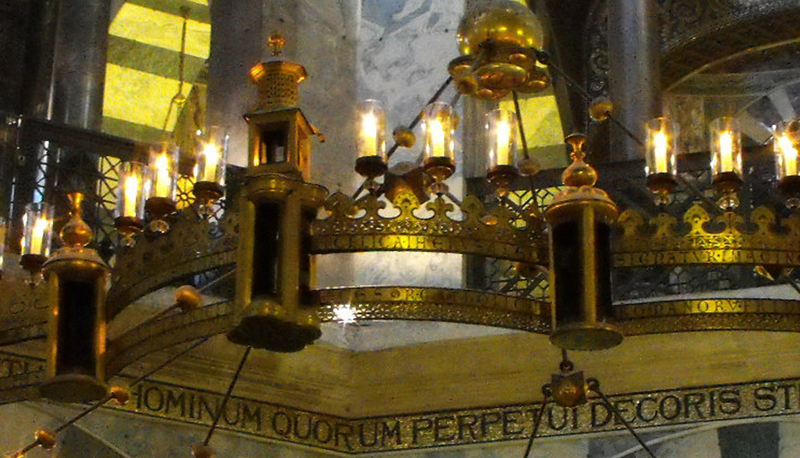 The corona, chandelier, Barbarossa's Leuchter, fortunately still exists, in great condition. 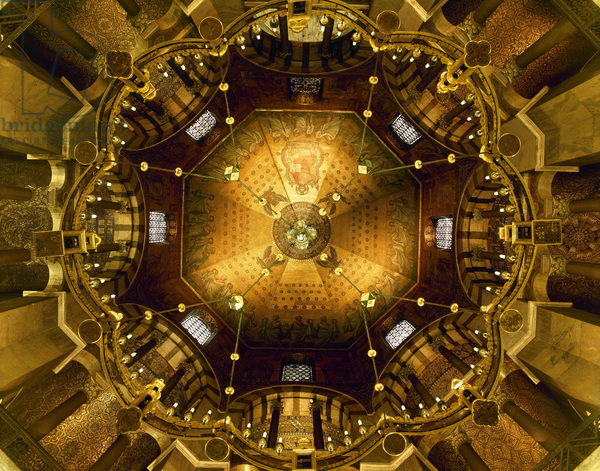 This view from directly underneath shows the ultimate intended visual effect: Christ enthroned in the heart of the city, surrounded by the Evangelists and 24 Elders (and matching perfectly the octagonal shape of the chapel). 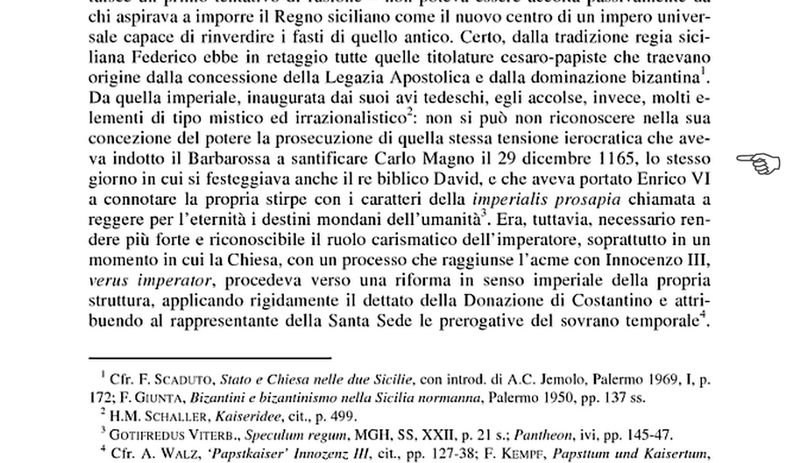 While looking up information on David in Florence, I learned that 29 December is his feast day in the Western Church (this was interesting to me in connection with his appearance in a Magi procession of 1429). This date brought me to a book which mentioned Frederick I ("Barbarossa") Hohenstaufen's canonization of Charlemagne, in the Aachener Dom (part of Aachen Cathedral now, but then the Marienkirche of the imperial household) on December 29, 1165. A competing tradition asserts that the Biblical Magi "were martyred for the faith, and that their bodies were first venerated at Constantinople; thence they were transferred to Milan. When Barbarossa overthrew Milan, these bodies were taken to the great Dome of Cologne [which didn't exist in 1165, the building was started 1248], and there they are venerated today." There are several traditions on where the remains of the Magi are located, although none of the traditions is considered as an established fact or even as particularly likely by secular history. Nach der Eroberung Mailands erhielt der damalige Kölner Erzbischof Rainald von Dassel die Gebeine 1164 als Geschenk von Kaiser Barbarossa. In dem Geschenk des Kaisers drückte sich auch eine politische Absicht aus. Die Gebeine der sozusagen „ersten christlichen Könige“ sollten dem Reich Barbarossas eine sakrale Rechtfertigung ohne Abhängigkeit vom Papst verleihen. Am 23. Juli 1164 gelangten die Reliquien nach Köln, wo sie bis heute im Kölner Dom verehrt werden. 1903 wurde ein Teil der Reliquien an die Mailänder Basilika des Hl. Eustorgius zurückgegeben. 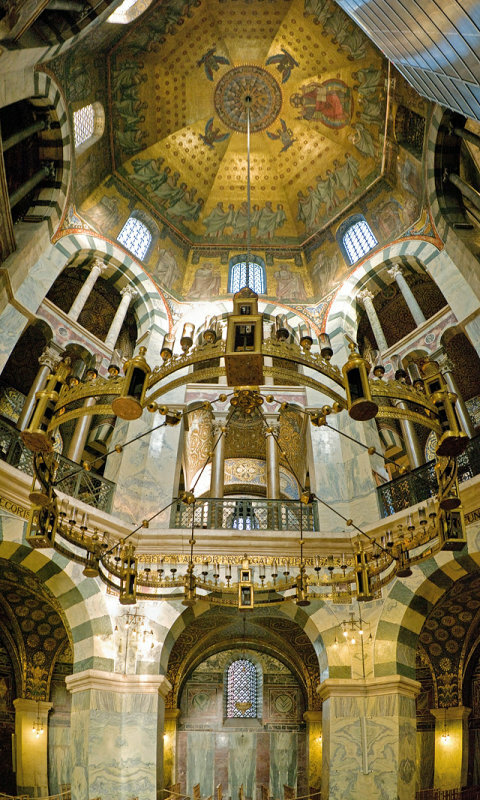 The Golden Shrine in the Dome (with the Magi, who in German language usually are addressed as "3 Holy Kings") is rather similar to the Golden Shrine, which is used for the bones of Charlemagne [in German: Karl der Grosse] in Aachen (ordered by Barbarossa). The late honors for Karl der Grosse served the interest to meet French claims, that Charlmagne would have been a French king. Also it seems to have served Barbarossa's interest to claim independence of the pope. David (29th of December) as 4th "Holy King" could naturally strengthen imperial interests. The day for the Holy Kings (6th of January) is not far from it, in 1165/66 likely both part of an extended Christmas festivity. Started to be build 527, one year after the death of Theoderich. The original Octagon, later a little bit increased, is the middle part. It became the crowning place for German kings in medieval time for about 700 years. 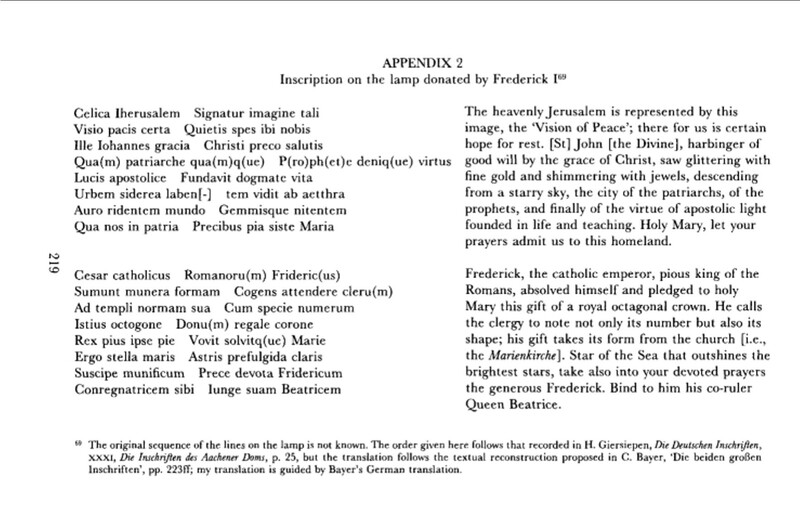 Right - Barbarossa's translation of the relics of the Reges Magi to Cologne is part of his ideological policy; Archbishop Rainald von Dassel was the architect of the religious angle (especially significant in both the Cologne and Aachen cults, which became joined in one symbolic gesture: coronation at Aachen, homage to Charlemagne, then procession to Cologne to pay homage to the Three Kings). I don't think David could in any way be considered a "fourth King", come to pay homage to Christ - David IS Christ, for the allegorical exegete (and in the biblical sense of father/forefather and son being one entity, as a continuous line).